When it comes to commercial weighing equipment, there may be plenty of fish in the sea, but world-class processing solutions is a far rarer catch. In 2014, A&D Weighing commenced work with the Lakes Entrance Fishermen’s Co-operative Ltd (LEFCOL), one of Australia’s largest fish receivers located in Eastern Victoria. The primary catch they receive is Eastern School Whiting, a lesser known relation of King George Whiting. 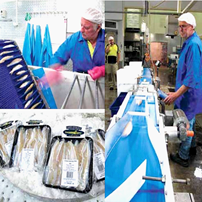 LEFCOL receives about one third of the national school whiting catch, which totals 1200 to 1300 tonnes per annum, and are now developing commercial quantities of value-added products. The huge volumes at hand would need to be matched with custom filleting equipment, which LEFCOL had managed to source successfully. However, the job was far from complete. LEFCOL first needed to procure a custom grading system to grade the huge volumes of whiting they were receiving each day. During their research, LEFCOL found that existing seafood feed-in technology was far too expensive and didn’t work effectively in sorting fish with a variation in size of almost 70% (from 15-25cm long). They needed an automated system that was not only accurate, but fast and capable of grading thousands of fish each day. By gaining an intimate knowledge of the nature of LEFCOL’s operations, we were able to design and manufacture a custom checkweigher specially optimised to grade the whiting they were receiving, factoring in everything from their size and shape, to variations in their firmness during winter and summer. The A&D EZI-Check checkweighers have fast moving conveyor belts which can quickly capture the weights to within one gram. Air jets triggered by the weights then sort the fish into predetermined categories – currently four, with options for up to six. Depending on the weight category they fall into, fish can either be sold for bait or pet food, set aside for automatic filleting, or sold fresh to domestic wholesale markets. Thanks to A&D Weighing’s custom checkweigher and other complimentary processing equipment, LEFCOL can now grade up to 200 fish per minute. Not only are they able to get the whiting from net to plate faster and fresher than ever before, the checkweigher’s ultra-precise measurements encourages fishermen to catch and target larger fish. This allows LEFCOL to generate better profits from the fish they process, while smaller fish are given a chance to grow. There’s no doubting it, A&D Weighing equipment is the reel deal. If you’re in the market for weighing equipment specially customised to your product, get in touch today.